India’s armed forces are frequently called upon to assist following natural disasters. But will they get what they need to defend the border? On October 3, the head of the Indian Air Force (IAF), Air Chief Marshal NAK ‘Charlie’ Browne, announced a slew of new measures that the force is planning to take to strengthen and upgrade its capabilities around the country. Among them was the decision to extend the runway at Kargil, a small town in Jammu and Kashmir made famous by the 1999 skirmish between India and Pakistan. Located midway between Srinagar and Leh, a north-eastern town not far from the Chinese border, Kargil airstrip will be turned into a full-fledged airport capable of handling the heavy and medium transport aircraft like the C-130J Hercules and the C-17s that the IAF is in the process of inducting. The decision to strengthen the Kargil airbase has come almost exactly a year since the Ladakh region was lashed by a devastating cloudburst that killed over 100 people and which critically affected the deployment and winter stocking of Indian Army troops along the Chinese border following the total collapse of the tenuous road network in the area. 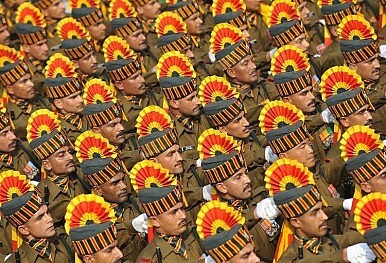 The Indian Army, present in the region in substantial numbers, responded almost immediately. More than 6,000 soldiers, along with personnel of the quasi-military Border Roads Organisation, set out with their heavy engineering equipment to reopen roads and rescue civilians trapped under the debris. The swift initial response saved hundreds of lives, although the Army itself lost a platoon of soldiers (over 30 personnel) when a landslide came crashing down onto their barracks. The inadequacy of infrastructure in the remote border area of Ladakh was brought home that same month when convoys of Army Supply Corps got stuck a number of times after roads were washed away completely. That’s when the Air Force decided to extend and upgrade the Kargil air base to provide an alternative supply base. Another forward air base at Nyoma—barely 25 kilometres from the China border—is also being modernized to initially allow transport operations, which will be followed by facilities for fighter operations. If it was Ladakh last year, last month it was the turn of another Himalayan state, this time Sikkim, to face the wrath of nature. An earthquake measuring 6.8 on the Richter scale hit the tiny state abutting China and Bhutan, killing more than 90 people and cutting off two crucial roads connecting the border areas in East and North Sikkim. Once again, the Indian Army pulled out all the stops to deploy its reserves, as well as elements of its Special Forces, to rescue those trapped in remote areas made inaccessible by roads that had been completely washed away. Temporary camps were opened; food was distributed; blankets were provided and medical help was given across the state. In both Ladakh and Sikkim, the Indian Air Force was the second responder. It moved hundreds of tonnes of engineering equipment, relief material like food, winter clothing, blankets, tents, medicine and rescue personnel to calamity hit areas by utilizing its transport planes, helicopters and even the newly acquired C-130J. Pilots of the Indian Air Force and the Army Aviation flew hundreds of risky missions to extricate those trapped in remote hamlets in high mountains, demonstrating once again the importance of the Indian Armed Forces in responding to natural disasters across this vast country. Armed forces the world over are trained and equipped to deal with such emergencies, but what makes the Indian situation different is the frequency with which the Army, Navy and Air Force get called in, and the effect this has on their preparedness, especially along the sensitive borders with China and Pakistan.